In the context of boiling water for pasta or other purposes, all over the Internet the advise is oft-repeated that salt should not be added to the water when it is cold in order to prevent damage to the pot such as pitting over long term use. The reasoning is that the salt stays on the bottom of the pot for longer without dissolving, and has a chance to interact with the surface metal. Is there any objective evidence--preferably scientifically based--that this phenomenon actually occurs in practical kitchen-type conditions, or is this another piece of common wisdom that is often shared but not backed by evidence, much like now debunked common wisdom that it is necessary to use very large volumes of water to cook pasta? There is empirical support for the effect of temperature on pitting corrosion, although from what little I'm able to understand of the very complicated metallurgy, the common explanation given is far too simplistic and the actual behaviour is not nearly as clear-cut as "colder = more salt crystals = more pitting", but rather due to something called transpassive dissolution (searching for this will give you lots of scholarly results on stainless steel corrosion). At low temperatures, extremely high breakdown potentials are observed, corresponding to transpassive dissolution, not localized corrosion. Just above the critical pitting temperature (CPT), pitting corrosion occurs at a potential that is far below the transpassive breakdown potential. But you can see from the graph that that's not the whole story, either. Excluding what happens at very high temperatures (above the CPT), the impact of temperature looks to be maybe 20-30%, but there are much more significant variations based on other factors, the most notable kitchen-applicable examples being the material (described as the PREN - Pitting Resistance Equivalent Number), surface condition (grit), and inhibitor elements in the solution (traces of which may or may not be found in tap water). While this does certainly support the conclusion, it's also obvious, if you read the explanation of pitting or look at the lovely reaction diagram on page 2 of the textbook link, that it has literally nothing to do with undissolved salt. In fact, pitting is caused by the Cl- ions specifically, and so can only happen after it is dissolved in the water. If you just poured salt on a dry pan in a dry environment, it shouldn't corrode. Moreover, pitting is a stochastic process - it's quite literally random even when you know all the other parameters, so while one can certainly average it out over many experiments and thus quantify the correlation with temperature, that ends up having little meaning in a kitchen setting because you are cooking with one pan/pot and the random variation seems to be a lot more profound than the effect of the temperature variable. 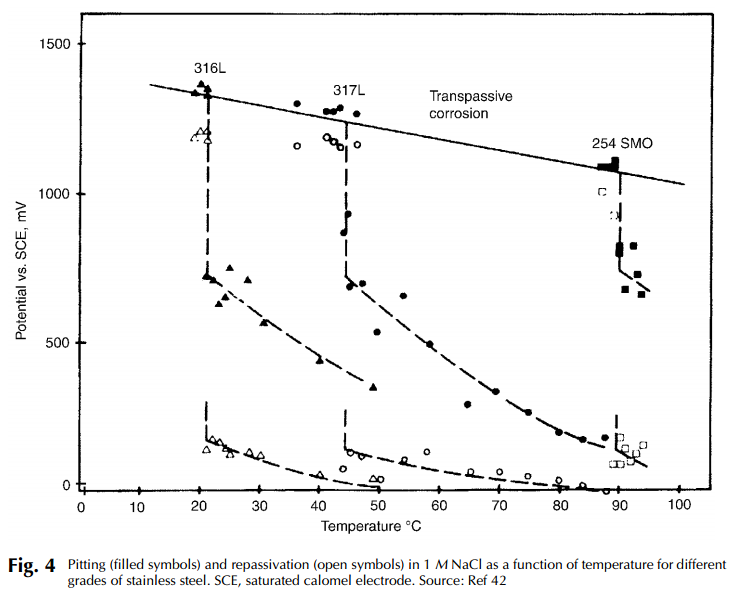 The addition of oxalic acid has accordingly a much bigger impact on the transpassive corrosion rate at 70° C than at room temperature [...] In the solutions containing organic additives at 70° C, transpassive oxidation starts at significantly lower potentials than at room temperature. In case you're not familiar with oxalic acid - or wondering why you should care - it's the primary ingredient in Bar Keeper's Friend, which many "premium" stainless steel cookware brands such as All Clad recommend using to clean your cookware - and nearly every cleaning guide recommends warm, but not hot, water. Admittedly, I just looked at the label and BKF doesn't specify a temperature, so the warm-water recommendation is entirely anecdotal - but looking at the above, it makes sense; you want to use warm water in order for it to be more effective, but using hot water (or even warm water for more than a minute or so) increases the risk of corrosion, especially if what you're trying to clean is caked-on salt or charred food. The effect of pH is more generally supported by various studies, where neutral is better (i.e. less corrosion), not to mention that strong acids cause the other type of corrosion (called intergranular), and yes, vinegar counts, although the effect is very slow, but still appreciable over time if you like to deglaze with boiling vinegar, for example. Even of the type of salt makes a big difference, if you scroll further down on that same previous link. Ammonium chloride is, for example, often found in sea salt, and it would appear to cause pitting corrosion much faster than the sodium chloride in table salt or kosher salt. If debris of any kind is allowed to accumulate on the surfaces of stainless steel equipment, it will reduce the accessibility of oxygen to the covered areas and pits may develop in such locations because of the reduced oxygen concentration. [...] ...carbon deposits from heated organic compounds are typical examples of this source of [pitting] corrosion of stainless steels. If you really want to protect your stainless steel cookware, just don't ever let it boil dry, and make sure to clean it properly if you start to see "stains" or "scum" on the bottom of your pan; those are dissolved salts and some organic compounds from the water and sometimes the food, and when they stick to the pan's surface, they do exactly what's described above - they block oxygen, and they do this for a much longer period - all day all every day as opposed to the 10-20 minutes you spent heating/boiling some water. That long, slow starvation of oxygen over hundreds or thousands of hours, as opposed to the minuscule amount of time it spends on the stove, is exactly what causes pitting. Short answer: Theoretically, yes, salt water at low temperature pits stainless steel faster than salt water at high temperature, although the popular explanation for the mechanism appears to be completely bogus. Practically, this factor is dwarfed by a dozen other factors and probably isn't worth worrying about at all. It typically takes thousands of hours for a pH-neutral, not-too-concentrated saline solution to cause any appreciable pitting corrosion at any temperature. What's more important is how clean the cookware is while it's stored, as that is the state in which it will spend the majority of its time, and as long as it's kept clean, salt-water temperature should not be a major concern. Not the answer you're looking for? Browse other questions tagged equipment stainless-steel or ask your own question. Why did the bottom of my stainless steel pan burn during seasoning?